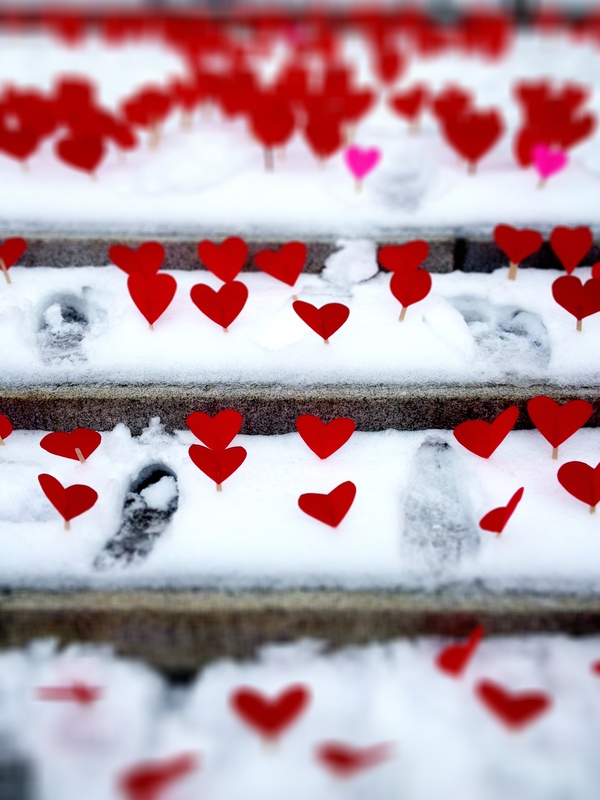 Detail, Hearts in the Snow, Steps of the Vermont State House, Montpelier. I have had the pleasure of working on a number of bills that are friendly to working families in Vermont. Times, as they always do, are changing in the workplace. After a generation of seeing labor policies erode, and seeing middle class jobs disappear (and, in Michigan, still going strong! ), we are trying to promulgate policies that try to help workers achieve a work/life balance that works for them and their families. I had the honor of reporting H.99, an act relating to equal pay, on the floor last week. This bill also included language that extend retaliation protections against workers, and extended protections for moms who need to express breast milk while at work. Also included in the legislation was a process that advocates for flexible work arrangements. This language, if signed into law, would be the first time it appears in statute in the United States. We also ask for a summer study committee in order to look at how paid family leave might be implemented in Vermont. Now, under most circumstances, I would be exceedingly proud of the work we did in our committee in bringing this bill out, and of the sponsors, including Jill Krowinski from Burlington. I am proud, don’t get me wrong, but sad as well, for these are policies that should have been implemented, and could have been implemented, at any time over the last 35 years. We received push back from the usual suspects — associations that would rather not see employees empowered to work with employers if they want or need a flexible work schedule. But in the end, the bill passed overwhelmingly because we, as a whole, recognized that we need to provide employers with a framework for a policy that will attract and retain quality employees. And our work on equal pay strengthens that important provision in a way that anticipates the proposed Paycheck Fairness Act. The House General, Housing & Military Affairs committee, which handles work-related and labor issues, among many other. will be addressing a number of bills over the next six weeks and in next year’s session, that will attempt to make our workplaces friendlier to workers, their families, and their employers. We can make changes that affect working Vermonters in a real ways, and I’m incredibly proud of being a part of moving these changes forward.